All Slots Casino is one of the most well-established New Zealand casinos in the industry. Established in the early 2000s, All Slots Casino has built a brand that is easily recognisable and reputable. Licenced by the Malta Gaming authority and accredited by eCOGRA, All Slots is a NZ casino online you can trust. Let us take a look at what makes this casino a reliable choice for real money casino players. All Slots Casino supports you all the way. Whether you are in the office, at home or on the move, you can access your favourite casino games. The variety of games available on mobile is not as extensive as you will find on your desktop. Players can still experience a wide enough variety such as roulette, pokies, blackjack, and video poker for hours of entertainment. All Slots Casino offers players a wide variety of the most reliable banking methods. This means you can worry less secure deposits and withdrawals and focus more on winning the next big jackpot. The security measures All Slots Casino has in place is something worth pointing out. They are all for safe gambling in the strictest ways. All Slots Casino use the best security measures, to ensure you are completely safeguarded from any fraudulent transactions. When making a withdraw, All Slots will require Kiwi players to verify their details before the payment can be processed. With All Slots Casino, players can find the widest selection on the web. They use the Microgaming provider, one of the most well-recognised providers in the industry. To ensure there is something to play, new games are added on a weekly basis. The average payout is 96%. Online casinos have become of the most competitive industries on the web. To stay ahead, All Slots offers the best casino promotions and bonuses. For signing up, players will receive a generous N$1500 welcome bonus. In addition, there is also a 5-tier loyalty program to look forward to. If you manage to make your way to the top, you will receive full VIP-status. With this, All Slots will offer you your very own VIP manager, plus exclusive lavish gifts custom-made just for you. There are also other exciting, daily, weekly and monthly promotions to look forward to. 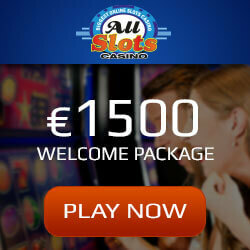 All Slots Casino is a secure online casino you can rely on. They are eCOGRA certified and licenced by the Malta Gaming authority, one of the most trusted licencing bodies. Their deposit and withdrawals are completely safe with the best encryption technology. The All Sorts Casino games are regularly tested for fairness by third-party corporations. With a 96% payout rate, they are certainly a casino worth signing up to. The All Slots Casino offers players excellent support 24/7. New Zealand casino players can get in touch with the casino via email, telephone or live chat directly from the website. The team is friendly and eager to resolve your queries or issues as quickly as possible in the most effective way. This is something you would expect from a casino with as much experience as All Slots. Live Chat: Directly on the website. Overall, our team of experts agree All Slots Casino is worthy of our seal of approval. They offer the all-round package to satisfy every player. Whether you are a novice or expert in online casino games, All Slots Casino is your one-stop gaming guide. We give them a well-deserved 4 out of 5 stars.